The next two pics are big fat THANKYOUS! And the next one is for shocolate because, when I was at first unable to download legomymalfoy's because our ISP had cut us back to dail-up speed till the end of the month, sweet, sweet shocolate took pity on this poor (desperate) Aussie and snail-mailed me said file on disk! Draco and Harry are so cute. I love their expressions so full of...expression. What I mean is they can easily rely a full fic based on their looks. And I love Draco's fuller, prissier lips and the fact that he's ever so slightly taller than Harry. Harry's nose and superhero jawline! Yeeeee. Okay, you are officially the best ever draws-Ron-with-stubble illustrator. I loooove how he looks!! Not rugged, but not George Michael. Just...typical normal guy who hasn't shaved in days...hm. That's how most of the guys here look, no wonder this appeals to me. *G* And Hermione and her bushy hair, yayyyy! I adore her smile, it seems so Hermione to me. All wide and thin-lipped but warm at the same time. They are perfection - you know I love Ron/Hermione! Oh - look at his EYES!!! You are definitely my favorite artist. :) I love them both, particularly the Ron/Hermione picture. Santa Claus is an Australian and he is drawing fan art for us lucky gals! BTW... how comes that even we all love all drawings you craeted each of us loves her own Leela drawing the most LOL? Maybe it's like loving an own child, eh? All children are splendid but the own ones is just a bit more splendid LOL. Oh, those are both gorgeous. I love the blur effect. MY! You have been a busy, busy bee. . .I love both of them. . .Especially the R/Hr as I'm always a bit partial to them. . .You are brilliant. . .What I wouldn't give for your talent. . I saw the other piccy that you linked to on my LJ. . .OH MY! that one was loverly. . .My hubby was like. . .Wow ::eyeing Hermione:: I loff her. . .HEH! so we both appreciated your art. Oh, but these are gorgeous! I love the soft texture -- what was your medium? Looks a bit like pastel to these untrained eyes. 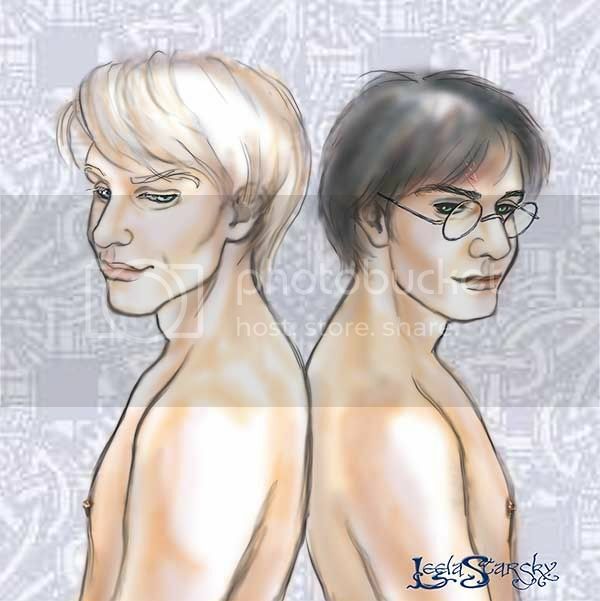 :) I especially love Harry and Draco for their skin tone and "not looking like actors"ness. Both pictures were done digitally with Photoshop and a Wacom tablet. :~) Glad you enjoyed them. Thank you so much. I'm glad I was able to help you with the file :D! gorgeous pictures! Speaking of the Morning After, are you going to be finishing ur story on Checkmated? I mean, it IS your story right? Those are both so beautiful!! You...really, you're so talented Leela! Your Draco is so beautiful! He's so perfectly haughty.You should draw more of him! Wow, beautiful, both of them! Hmm. I don't know if this is the place to ask or not. I remmeber reading that you did commisioned art. Is there only specific pairings you would do?